With a great mix of authentic wild west experiences, stunning natural beauty and wildlife, this escorted tour offers amazing experiences that will last a lifetime. 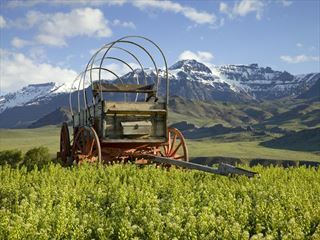 This incredible 7-night western adventure will ignite your pioneer spirit as you travel across this western landscape. This ‘Last of the Old West’ town proudly displays its western heritage and charm making the perfect start to your epic Cowboy adventure. 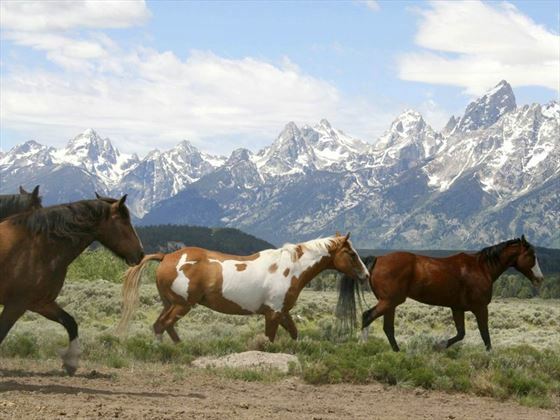 Jackson Hole, Wyoming is nestled perfectly between the Yellowstone and Grand Teton National Parks offering truly majestic backdrops. Your morning starts with a visit to the national Museum of Wildlife Art featuring works by such luminaries as Andy Warhol and Georgia O’Keefe. Inspired by the ruins of Slains Castle in Aberdeenshire, Scotland the museums architecture provides the perfect setting for housing this inspirational artwork. Stroll Jackson’s chic downtown area, taking in the Antler Arch at the entrance to the town square. This evening you’ll enjoy the taste of the Old West when you join a covered wagon ride past Cache Creek Canyon for some traditional entertainment as you dine ‘Chuck Wagon’ style. 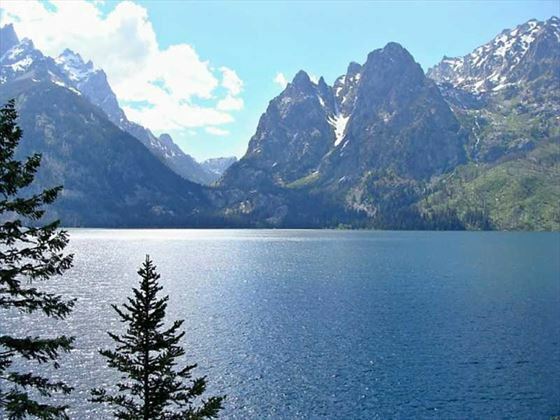 Gently weaving through the Grand Teton National Park, you’ll wonder at the magnificence of the snow-capped peaks, before visiting the unparalleled natural beauty of Yellowstone National Park. 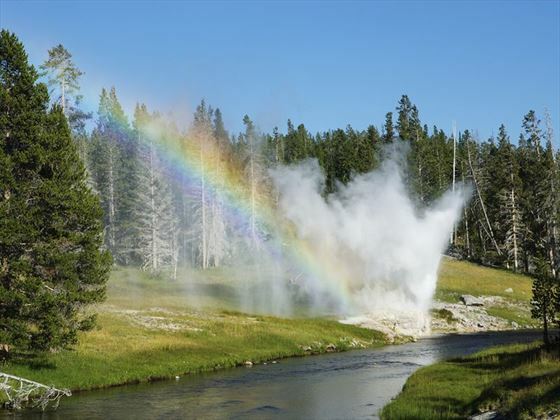 Renowned for its geysers, hot springs and incredible wildlife, Yellowstone is also the world’s oldest National Park. Touching three national parks across its 3,470 square mile range Yellowstone epitomises the USA’s west. Wonder at the free-ranging buffalo herds as you immerse yourself in the incredible wildlife, famed geysers and hot springs. ‘Old Faithful’ is a must, as this famous geyser sends a 130-foot jet of steam skywards. As you enjoy the unspoilt landscapes a park guide will narrate the park’s historic and future timelines. 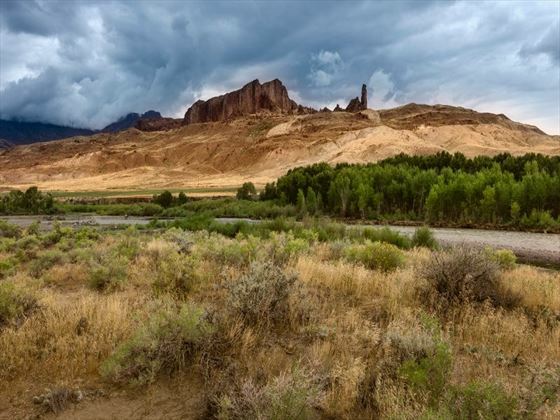 Taking the winding highway through the beautiful, tree line Sylvan pass with its dramatic mountain vistas, you’ll start the transition to the wide-open prairies as you arrive into the iconic wild west town of Cody. The town is named after its most famous and colourful resident, as is the ‘The Buffalo Bill Center of the West’ which comprises five museums and offering fascinating insights into his life and legacy as well as local native American culture and a 19th century firearms exhibit. 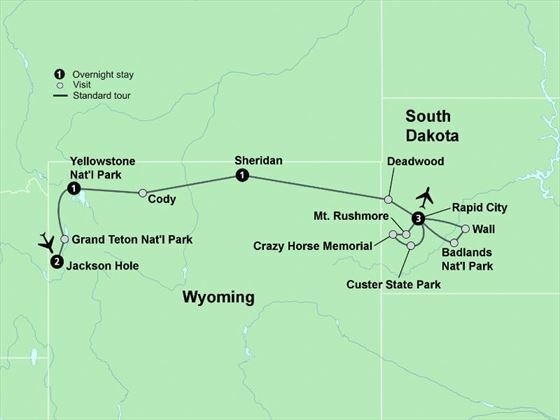 Continuing on across the prairies you’ll pass through the stunning Bighorn Mountains and into the territory of the Great Sioux nation before arriving into the small wild west town of Sheridan. 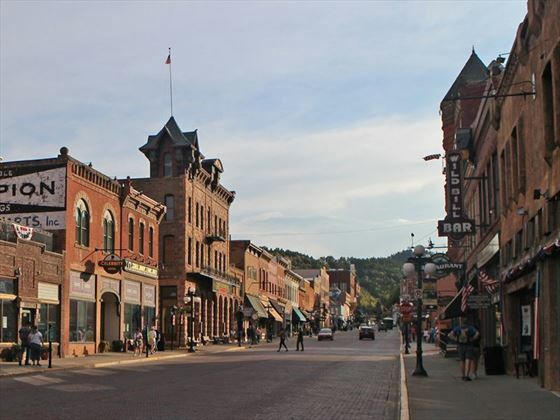 Today you’ll visit the bustling town of Deadwood, South Dakota, restored to give a distinctly late 19th century feel, famed for its gold rush history and as the final resting place for Wild Bill Hickock and Calamity Jane at Mount Moriah Cemetery. Next, you’ll make a stop at Tatanka: Story of the Bison established by Dances with Wolves actor Kevin Costner. This interpretive centre showcases the relationship between these incredible animals and the Lakota Native Americans. 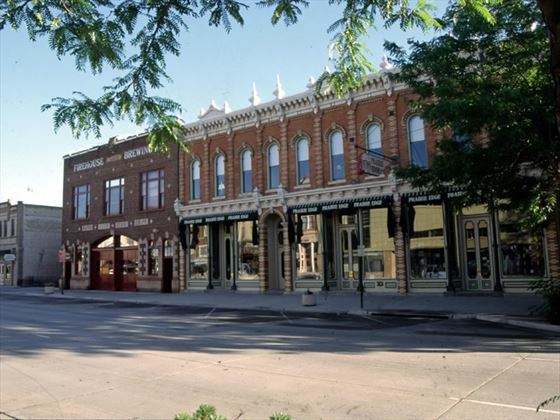 Later, arriving into Rapid City the rest of your day is free to explore the town’s vibrant six block downtown area. Today you’ll venture out into the Black Hills on a tour of Riddle’s Black Hills Gold and Diamond factory. 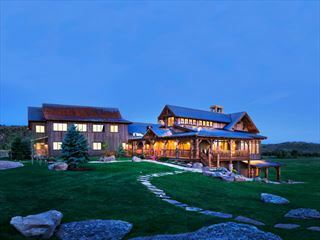 Here’s you’ll witness skilled artisans craft South Dakota’s official state jewellery. 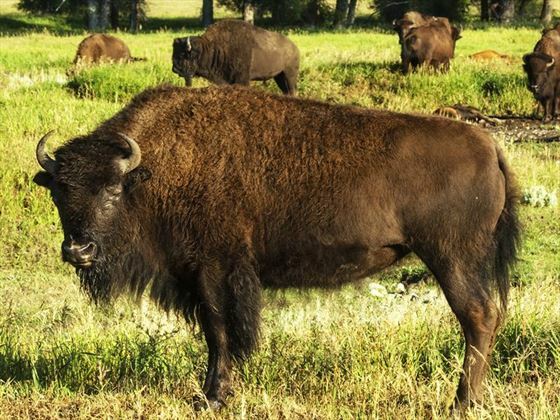 From here you’ll head on to Custer State Park in search of the 1,300 bison roaming free amongst the park’s expansive forests and grasslands. Your guide will provide an insightful narrative on this magnificent creature along with the native pronghorn antelope and elk. 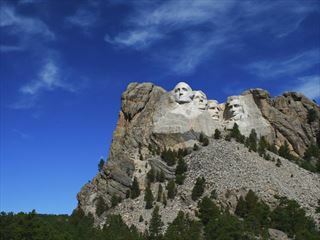 Nearby, you’ll wonder at the Crazy Horse memorial, with its incredible mountain sculpture - still under construction. Here you can also witness native American artisans practice their crafts at the monument as well as explore the Indian Museum of North America. In the evening you will get the chance to observe the illumination of the iconic Mt. Rushmore as part of the evening lighting ceremony. 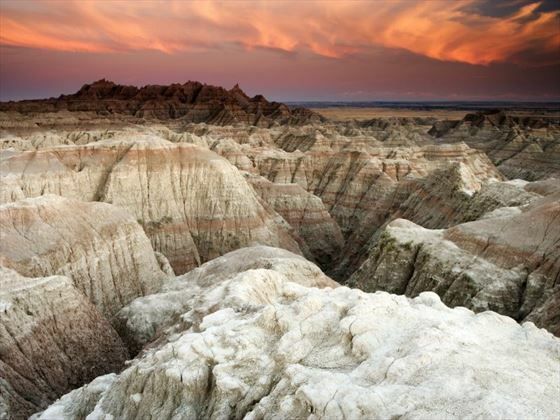 Following breakfast, you will head to the remarkable cragged Badlands National Park, where you’ll tour the visitors center taking in a video introducing the area. Following the Badlands Loop Road to Wall Drug you pass the incredibly vibrant multi coloured rock formations along the way. Wall Drug is a fascinating 1930’s classic store and popular roadside attraction. Here will have lunch and take time to browse the store’s delights. This evening you will be joined by a local Lakota Native American for your farewell dinner to recount his adherence to his roots and Native American way of life. Your Cowboy Country adventure end today leaving with you a multitude of amazing memories.